The big action of the week was the Northern Athletics Cross Country Championships at Pontefact Racecourse on Saturday where conditions were bright and dry with a firm course. 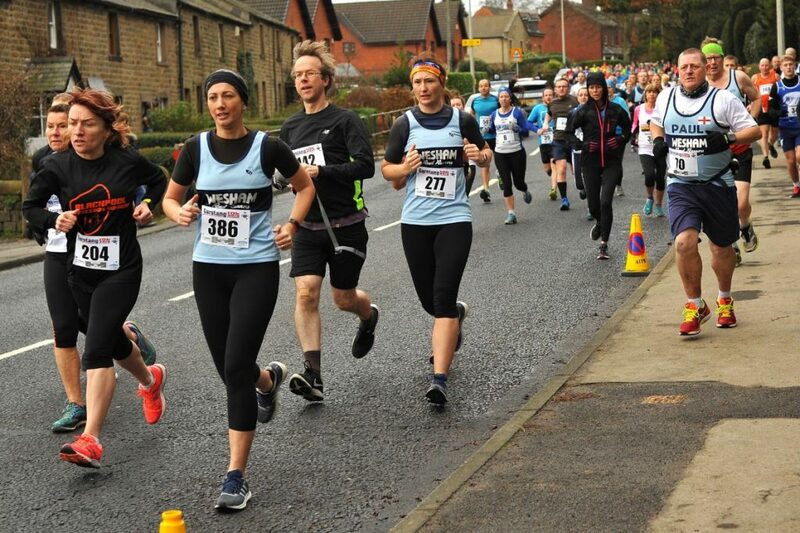 Wesham had a good entry, and in the Senior Women’s 8k race Anne Mayers-Smith finished 233rd in 39:46. The Senior men ran over 12k and right to the fore was Wesham’s Rob Danson who had a stormer of a run to finish 9th overall contesting the lead at one point, finishing in a time of 39:28 just 1:24 behind the race winner Emile Cairess of Leeds City. This will give Rob serious street cred in the Inter-Counties in March and is the best-ever performance by a Wesham athlete. David Taylor had a good run finishing 237th in 46:51; Mark Bellfield was 334th in 49:14; Mark Renshall a good run finishing 498th with 53:46; John Collier 589th in 57:40; Ben Wrigley 633rd with 1:01:08 and Martin Bates 639th in 1:01:24. Peter Bartlett finished 699th in 1:15:19. The team placed 37th overall. There were 4 Lancashire clubs fielding a Men’s team and 3 clubs with a Women’s team. By contrast conditions were appalling on Sunday morning with severe gusting winds along the St Annes and Lytham Promenades for the annual St Annes 10-Mile road race. There were 12 Wesham women competing which was a tremendous turnout. Kerry Eccles took the lead, running with Louisa Denye until edging away for the finish, coming in 40th woman and 9th W50 in a time of 1:31:23 in 162nd place overall. Louisa finished 43rd woman and 19th W40 in 1:31:44 for 165th place in the overall race. Elizabeth Johnson was 46th in 1:33:07 and 173rd overall, with Vicky Gore 49th, 22nd W40 and 180th overall with 1:35:05. Maureen Danson was 57th woman and 188th overall, 14th W50 in 1:35:42. Anne Berry came in 58th and 189th in 1:35:46 for 15th W50. Fran Hodskinson finished 68th and 18th W50 in 1:38:18 and 205th place. Tanya Barlow was 75th and 221st in 1:39:55 and Emma Wright was 79th and 228th with 1:40:24. Antoinette Holton placed 91st woman and 241st overall with 1:42:40 while Diane Blagden was 93rd and 244th in 1:53:12. Debbie Myerscough finished 128th woman and 292nd in 1:50:07. The Wesham men were on fine form and finished 3rd team behind Chorley and local lads Lytham. Simon Denye was leading the way and finishing an excellent 5th in 1:04:05, 2nd M40. Lee Barlow was 21st and 8th M40 in 1:10:07, with Sean Murray having the run of his life to finish 42nd in 1:15:51, paced nobly by Steven Gore who returned the same time in 43rd place. Stuart Clayton had another great run to finish 46th with a time of 1:16:44 and 5th M50, and Thomas Farquhar returned 1;20:05 for 75th place. Stephen Browne placed 84th for 1:21:34 and 17th M50 with Alan Hudson in tow for 85th place and 4th M60 (5-year age groups not recorded) in 1:21:36. Rob Wallace finished 92nd in 1:22:31 and Ben Wrigley 117th with 1:25:24. James Danson came in 119th in 1:26:07; Peter Rooney 124th and 6th M60 with 1:27:19 and David Millar 140th in 1:29:32. Wesham had a good showing of members in the Sheriff 10k in Scorton north of Garstang. Chris Hastwell had a great run for a new personal best time of 39:19 finishing 12th over the undulating course in very challenging weather. Garry Barnett ran very well for 3rd M50 and 14th place in 39:25 although he reports he was tiring in the latter stages. Steve Myerscough opted for a well-paced run as he recovers from injury and he finished 35th in 42:42. Lee Nixon ran well for 39th place with a time of 43:14. Paul Carter ran 57:17 for 270th place. There were 408 runners in this popular race. Wesham members were spread out far and wide on the parkrun network on Saturday morning. At the Preston run in Avenham and Miller Parks Steve Myerscough kick started his weekend with a time of 21:06 for an M45 age graded performance of 67.22%. Nigel Shepherd kicked the dust with 21:28 for M60 74.69% and Robert Brown completed his 320th parkrun in 25:51 with an M60 percentage of 62.60%. In St Helens Victoria Park Chris Pike clocked 27:37 for M40 50.56% and the parkrun tourists were in Southport’s Hesketh Park with Steven Gore running the fastest time of the day with 18:34 for M35 71.90%; Vicky Gore 25:54 for W40 60.30% and Megan Gore JW11 45.95% with a time of 35:26. At Fell Foot near Newby Bridge in the South Lakes James Mulvany paced his son Evan to 26:04 with his time 26:05. The biggest turnout was at Lytham Hall, with Ian Garrod running 21:19 for M55 72.71%; Jonathan Lawson 21:53 for M50 67.94% and Martin Allison 23:06 with an M35 grade of 57.07%. Finlay McCalman clocked 26:01 for an M50 performance of 58.55%; Stephen Twist ran 26:35 for M50 56.36; Maureen Danson 28:08 and W50 61.08%; Jo McCaffery 28:09 with W40 54.65; Sharlan Butcher 28:17 and W45 56.16%; Emma Davies 28:48 with 51.39%; Keith Wilding 29:59 and M60 53.97%; Sue Rigby 31:16 and W45 50.80%; and Michael Hall 33:59 for M40 41.39%. In the Blackpool Stanley Park run Stuart Topping ran 22:58 for M45 63.21%. Dave Marsland clocked 23:19 for an M60 performance of 70.62% and Ryan Azzopardi 24:24 for M35 55.12%. Andrew Moore ran 26:16 and an M55 grade of 59.52%; Rob Wallace clocked 26:31 and an age grade of 48.65; and Dawn Biggs recorded 30:54 for W50 54.91%. In the Fleetwood Promenade run Peter Cruse was to the fore with 21:15 for M55 72.94%; George Kennedy ran 23:52 for M60 67.81% with Suzanne Leonard 23:53 for W45 68.53%. Brian Jones clocked 31:34 for M55 49.52%. This entry was posted in News by Dave Young. Bookmark the permalink.